We’re pleased to kick off our monthly “Biker Spotlight” with Sharon Lynn, a spirited young lady from Indiana. Sharon rides a 2007 HD VRSCDX Night Rod Special, with plenty of mods. 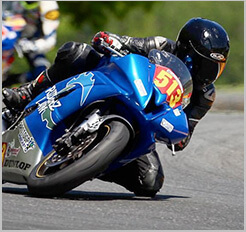 In fact, Sharon has drag raced this bike on tracks around the country. I chose to take the Riders Edge class on the fist Mothers Day after my Mom’s passing to distract me. Little did I know that it would change my whole disposition. A little over 3 years, and 19,000 miles, I am a new woman. Last summer I dipped my toe into the drag racing pool. My very first real race was at the AMRA Fall Finals in Bowling Green, KY. Talk about baptism by fire! I actually won the first round, and broke out in the second. (As far as I’m concerned, giving the guy next to me a 2 second head start and still beating him at the finish line is a win to me, even IF I went ‘too fast’!) This year I plan on hitting 4 AMRA events, 3 in Kentucky, and one in Michigan. The plan is to hook the bike up with nitrous *big cheesy grin*. 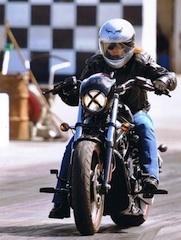 Check out Sharon’s pics, and read more about her on our Biker Spotlight page. And be sure to vote for her in the “Real Lady Riders” calendar contest at www.beltdrivebetty.com.